Just as we thought things in Geneva couldn’t get much more interesting after news of the Audi A3 E-Tron concept, this happens! 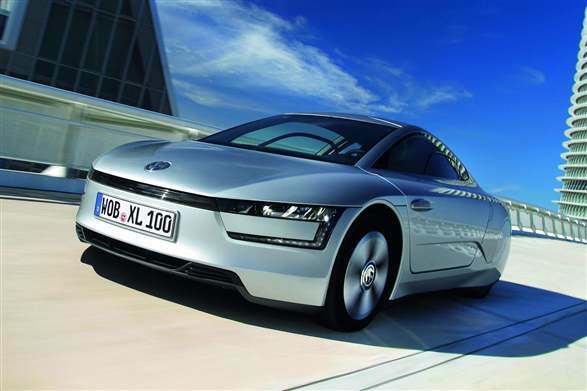 Volkswagen is making the headlines again today with the announcement that the incredibly efficient and futuristic XL1 is set for production in 2013! Now we’ve read about this car before, and concluded it would never happen, but now we stand corrected. Just from looking at it, you know the XL1 is going to offer something out of the ordinary, and it most definitely does; Volkswagen claim it could do up to 313mpg with emissions at 21g/km of CO2. The styling is quite frankly mental, though not without purpose, as everything is done in the name of aerodynamics with the XL1; they have removed the wind mirrors in favour of two small cameras and the rear wheels are faired inwards and covered by a round carbon fibre panel, though we are still dubious as to whether or not this will feature on the production model; the cover would probably just end up causing complications which lead to higher MOT and servicing costs. Now, the efficiency is the most revolutionary aspect of this car, and it is all thanks to a 47bhp 0.8-litre diesel engine and a 27bhp electric motor, which means 74bhp overall, which may not sound a lot, but when you’re dealing with a car that only ways 795kg, you’d be surprised. The XL1 can do around 30 miles on electric power alone and you can charge the car battery from a home socket.